The European Environment Agency (EEA) is a European Community institution with the aim of serving the Community and the Member States with information to support policy making for environmental protection put in the perspective of sustainable development. We do that by collecting and assessing data on the current and foreseeable state of the environment. Are the EEA's products and services accessible and useful to stakeholders? The European Environment Agency is preparing for the Göteborg European Council the second edition of its Environmental signals indicator report. This report will confirm some of the findings of the first report and provide some new insights in the development of major environmental issues in the EU. Climate change: for all six greenhouse gases under the Kyoto protocol data show a decrease of 2% between 1990 and 1998 for EU15. Latest projections however foresee that the decrease up to 2010 will be only 1%, still far from the 8% cut needed according to the Kyoto protocol. Behind the slight decrease in the emissions of all gases stands an expected 3-4% increase in carbon dioxide emissions. A distance to target analysis to show where more needs to be done. I will come back to these principal characteristics later, but before doing that I would like to give you my view on the developments in the environment and the resulting policy responses . In spite of the relative success of environment policies particularly at EU level, there had not been a general improvement of environmental quality and little progress towards sustainable development. From then on, the progress towards sustainable development and even on environmental quality would not come directly from environmental policies, but from socio-economic policies, guided by sustainability and reinforced environment policies. Environmental quality and health (theair we breathe, the water we drink, the food we eat should be clean). For tackling the mentioned issues and dealing with sectoral policies the prospects, we indicated, were brighter than at any moment in the past. The latest developments have shown that it was right to be hopeful as a more efficient framework for action allowing the continuous review of policies under a timely, consistent framework is emerging. This is guided by the sustainability goal (Art. 2 and 6 of the Treaty) and the so-called Cardiff Initiative (June 1998 Summit), which is implementing Göran Persson's proposal in December 1997 (Luxembourg) to put sustainability in faster track. However it is important to use these opportunities now and provide a clear way forward. The development of the Cardiff initiative through the Helsinki European Council, to be continued in Göteborg, provides an example of integrated thinking in policy development. It is hoped that the so-called Lisbon process, starting with the March 2000 European summit on employment, economic reform and social cohesion, will be the start of a equally intensive process for integrating social and economic aspects of development. In the end, of course, both processes from Cardiff to Göteborg and from Lisbon to Stockholm have to lead to some ‘joined up thinking' on all aspects of sustainable development. Keywords in both processes are and will have to be transparency and accountability. The EC is asked to prepare a proposal for 6th EAP (end of 2000) and a long-term strategy dovetailing policies for economically, socially and ecologically sustainable development to be presented to the Gothenburg summit (also as an input for the Rio+10 review). From these conclusions we can see a process emerging (figure 1). 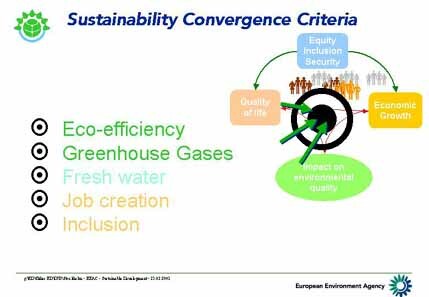 In this model the EU sustainability strategy forms the chapeau for two parallel lines of policy development: (1) The environmental issues and environmental policies in a narrow sense are covered by the development of the 6EAP and the envisaged thematic plans. (2) The integration process is carried out in the development, implementation and follow-up of sectoral environment integration strategies. In September 2000 the Commission adopted its Communication on Structural Indicators. It includes a set (27, and 11 to be developed) of socio-economic indicators around the themes Employment, Innovation, Economic reform, and. Social cohesion. Energy efficiency is included, but no other aspects of the environment. The aim of these would be to progress to an EU "... capable of sustainable economic growth with more and better jobs and greater social cohesion" A first report will be delivered to the Stockholm summit before Gothenburg. Commissioner Solbes mentioned in a speech "the indicators provide an instrument for monitoring, benchmarking and peer pressure which are vital elements of the Lisbon follow-up strategy". His technical arguments for the choice are in line with the "state of art" rules: comprehensiveness — discipline - continuity — learning by doing in an ongoing process. As the Lisbon process so far focused on the social and economic dimension, one key linkage has been overseen so far. 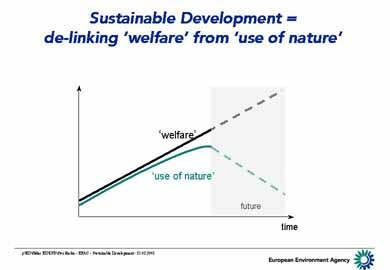 It is symbolised in figure 2 which shows as the top line economic production (and the welfare we get from produced goods and services) and as the lower line the pressure on the environment. The latter should be decoupled from the former for development to move in a sustainable direction. To achieve a more sustainable development by decoupling is not only a question of environmental policies as has been argued above. It requires real integration to search for cost-effective solutions to make it happen and to adjust production and consumption in such a way that their further growth does not negate the achievements made. If this model develops it may help not only to reduce the inconsistency between environment and economic and sectoral policy but also between those polices themselves (such as between energy, transport, agriculture and taxation), and it could show that the environmental sustainability part is the area which is maybe the most advanced in terms of accountability. Recalling the words of Commissioner Solbes on indicators, monitoring, benchmarking and peer pressure (see before), such an extended ‘three corridor system” must be accompanied by interlinked indicators. 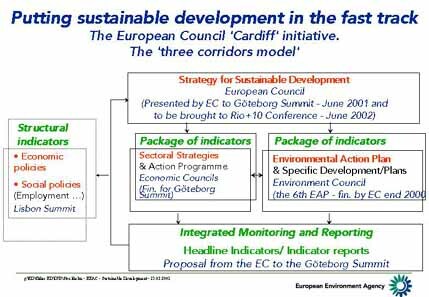 As the main policy activities are happening within each of the corridors, it seems most logical to derive such a set of overall EU sustainability (headline) indicators from the existing initiatives, instead of trying to develop a separate set of indicators to go with the sustainability strategy. Score cards for comparing the progress made by countries allows for "naming and faming” for those who achieved a lot, with the potential for the others to learn from the experiences, and for "naming and shaming” of those that failed to achieve progress. Assuming that policy developers in the EU aim at a rational and efficient set of policies we may expect that under the sustainable development strategy a number of interlinked and mutually supporting policies will emerge. Speaking as one of those who provide information to support policy making. I would like to sketch how we see progress reporting and assessment of such an integrated set of policies developing. 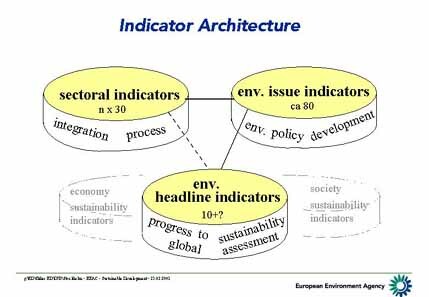 In parallel to the ‘corridors' in strategic policy making, clusters of environmental indicators are being developed (fig. 5). The sectoral integration strategies (sectoral sustainability) need to be monitored using indicators for the integration of environment and sectoral policies. The Transport and Environment Reporting Mechanism as developed by the EEA with support of Eurostat and the Commission is a good example of these. The EEA is now, together with its partners, developing similar reports for Energy and Agriculture. Attention is needed to ensure good co-ordination between the sectoral reporting mechanisms. The recently published proposal for indicators for enterprises, for example, seems not to be consistent with the whole system. An EEA publication providing a common framework for reporting on the conventional sectors is in preparation. The 6th environmental action programme and envisaged specific action plans to achieve environmental sustainability need to be monitored using sets of selected issue indicators. The EEA is currently developing proposals for these. 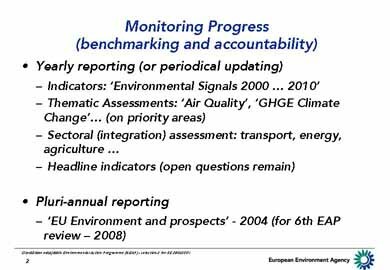 The EEA's Environmental Signals report series will develop into the main indicator report on environmental sustainability. 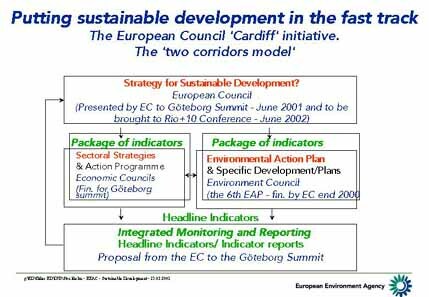 The EC Communication (COM(2001)31) including the 6th EAP (‘Environment 2010: Our Future, Our Choice' and a proposal for a Council Decision) try to establish not only the environmental sustainability pillar of the Sustainable Development Strategy but also to define the accompanying accountability (monitoring and reporting), all that in a time perspective of year 2010 that was the one used for the EEA's outlook report. The European Commission together with the EEA, Eurostat and the member states will soon publish the first report on environmental headline indicators. 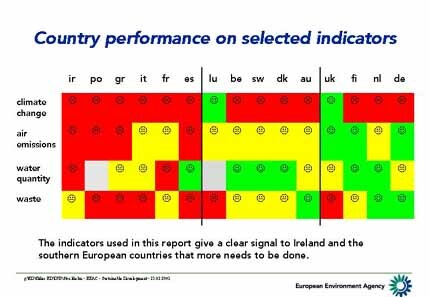 This is a very limited set of 10 indicators on the main EU environmental problems. There are a few common elements in all of these indicator sets. The indicators should not just be presentations of statistics, but be part of an analysis of progress made. That means that as far as possible the indicators should be developed as performance indicators (linking with an agreed target), as efficiency indicators (showing the relation with production and other economic variables) and as policy effectiveness indicators (showing the effect of policy measures and structural developments on the variable). The analysis of progress made should include a comparison with peers. 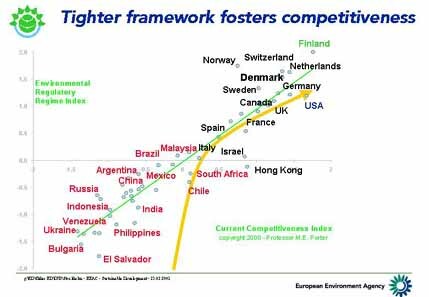 The indicators thus also form a starting point for a benchmarking exercise between countries, between sectors and between other actors (see figure 4) . As consistency is the main theme of my presentation, it will be no wonder that also in reporting consistency and discipline should be strived for. Consistency is needed in choosing indicators to report on thematic action programs making sure that sectoral contributions can be identified. Consistency is needed in the sectorenvironment reporting mechanisms to allow for comparing progress between sectors and to be able to analyse and compare progress in the use of ‘integration' instruments. 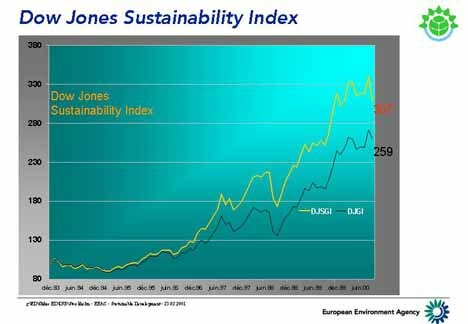 Consistency is also needed in the further development of the ‘headline'indicators and the development of a merger between the structural indicators, the environmental headline indicators and the eventual sectoral headline indicators. Will all the sectoral-economic policies dare to agree on a package of (consistent) indicators? Will the "Cardiff initiative” (leading to Gothenburg) and the Lisbon process (leading to Stockholm) join up? And in relation to this: will the EC proposal on a sustainability strategy set the model and the process for establishing the three pillars of sustainable development (social -- economic -- environment)? Having identified the headline indicators, further fine-tuning between policymakers formulating quantitative targets and indicator makers providing more appropriate indicators should happen. One point must be clear however: headline indicators need to go as much as possible with quantitative targets that are consistent. As the EMU convergence criteria were able to move states quickly in the direction of Euroland, the headline sustainability targets should be able to move societies towards a general improvement of sustainability. What we need now are sustainability convergence criteria! It is said that "For every complex problem there is a simple answer and it is always wrong”. Well, when policy makers are able to agree on the simple approximations, they often work. Apart from the EMU convergence criteria, we have seen examples in the use of the Kyoto target for emissions of a basket of six greenhouse gas, the negotiations in the framework of the Convention on Long Range Transboundary Air Pollution using no exceedance of critical deposition loads as starting point. We should not be afraid to develop some bold measures and accompanying bold targets. 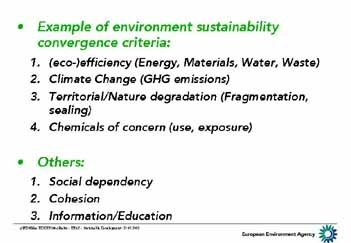 Secondly, use of the sustainable convergence criteria requires simplicity, in other words the answer to the question "what is really important and at stake”. Especially the business sector has been very keen on answering these questions to be able to use environment like other criteria in business management. Generally the business sector is quite advanced in incorporating environment as a production factor in decision-making processes. As many of the "new” approaches such as benchmarking and integration stem from business management and financial accounting, it is no wonder that the business sector has applied them also to environmental and sustainability issues. Few people are aware of this progress and government administrations certainly can learn from companies. This interaction between companies and government could even lead to a re-inforced co-operation in the field of the environment and sustainability. Companies at the forefront of sustainability thinking have joined together in the World Business Council for Sustainable Development. Wouldn't it be an idea for nations to join in a similar club of Member States for sustainability? Companies have realised that innovation in environmental protection, service economy, and consumer ethics is a key to success. 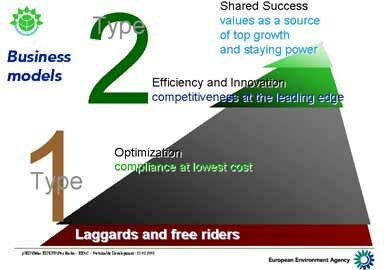 Figure 6 borrowed from the WBCSD illustrates this idea that companies perform financially better if they use business models based on an active pursuit of efficiency and innovation. The business sector is for itself now formulating sustainability convergence criteria to have a clear target, to be able to benchmark and the monitor progress (Figure 9). It is now up to national governments and the EU to develop their sustainability strategies in a similar clear and transparent process. For references, please go to https://www.eea.europa.eu/media/speeches/stockholm_2001 or scan the QR code.